Personal Statement ﻿By applying a metaphorical language, Ana creates works through labor-intensive processes that can be seen explicitly as a personal search in life. 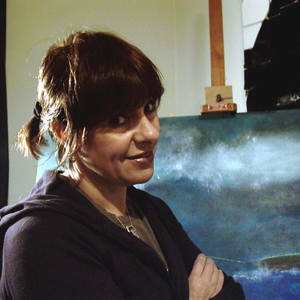 Her works appear as dreamlike images in which fiction and reality meet, meanings shift, past and present fuse. Time and memory always play a key role. Her romantic inclination towards the sublime and the magical aesthetic categories lingering between projection and perception, coherence and chaos is the reason that her works are described as Magical Realism. By referencing metaphors and symbolism, she creates intense personal moments conceived by rules and omissions, acceptance and refusal, luring the viewer into their own significances. Ana's work is a conversation in color inspired by the intricacies of nature. Through her paintings, she explores texture, color, and process. Texture is a significant component of her work as her goal is to create a surface, not just paint one. About her work Ana says: "While creating sculptures and paintings, I try to suggest a story, not only of the moment but also of an entire life. Not only of what we can see, but what is invisible to the eyes. Art is like a mirror, that is why it is so powerful"